No one knows what originally caused the crack in the State House Bell, known today as the Liberty Bell. Its predecessor, installed in 1751 in the tower of the Pennsylvania State House, also known as Independence Hall, cracked on the first test ring. 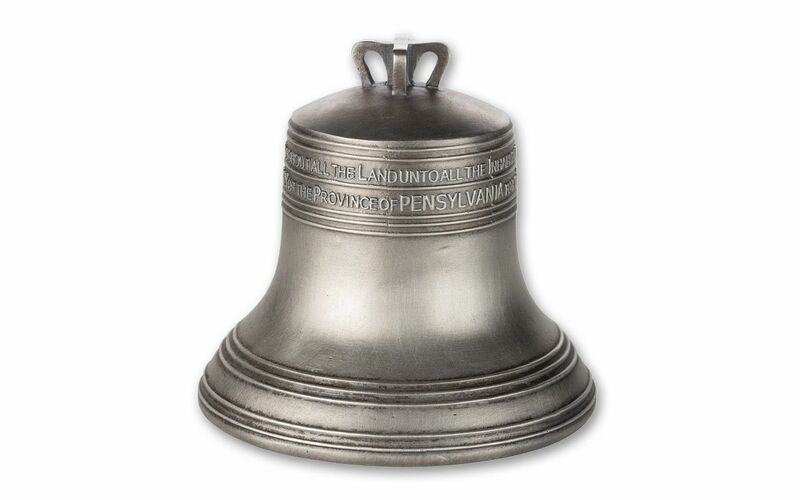 Not wanting to order a second bell from the Whitechapel Foundry in London, Pennsylvania Assembly Speaker Isaac Norris instead allowed local metalworkers John Pass and John Stow to melt down the bell and recast a new one right there in Philadelphia. It went on to be used for nearly 90 years, calling lawmakers to meetings and gathering townspeople for important news. 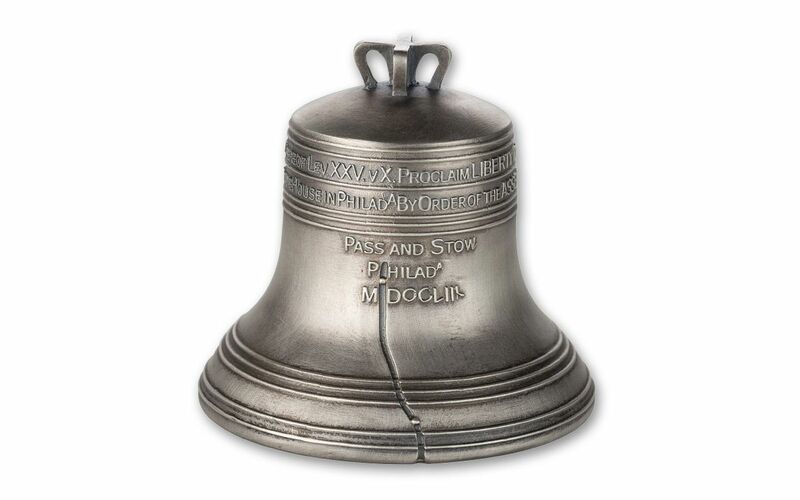 It was not until the 1830s that the old State House Bell began to take on a significance as a symbol of liberty – and soon after, in the early 1840s, a narrow split began to develop, and a repair was required. The larger split you can see on the bell today was actually the result of the repair job, used to stop the further spread of the crack! However, it didn’t work, and a second crack silenced the bell forever. While no person living today has heard the sound of the bell’s toll, you can still take home your very own version of the bell, cracks and all! 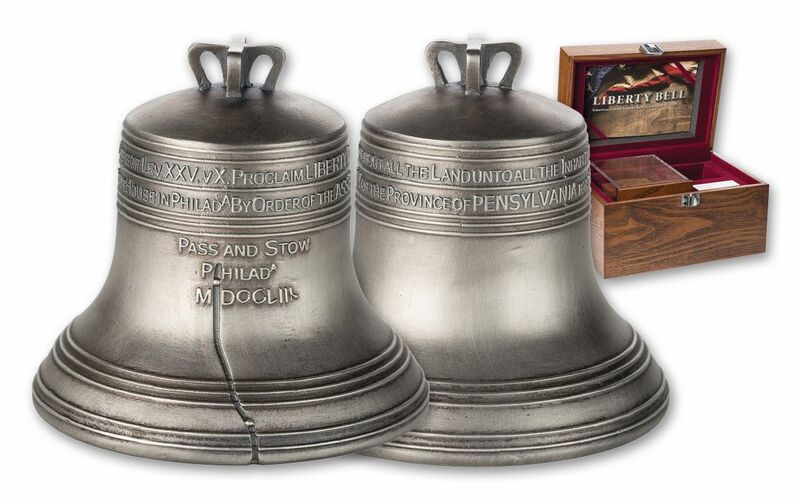 Struck in four ounces of 99.9% silver, just 1,776 of these beautiful antiqued Liberty Bell coins exist. They come shaped like the real thing, inscription and all, and even come in a mint wooden case that houses the coin in a second display case perfect for displaying your new acquisition just as the original appears in Philadelphia. 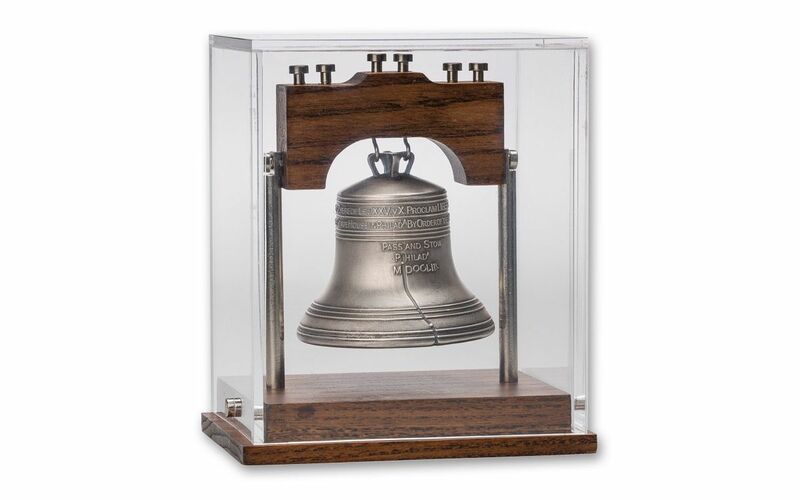 UNIQUE BELL-SHAPED COIN – This “coin” is actually a miniature replica of Philadelphia’s iconic Liberty Bell. It’s accurately detailed right down to the crack in the bell and the inscriptions that proclaim liberty throughout the land. 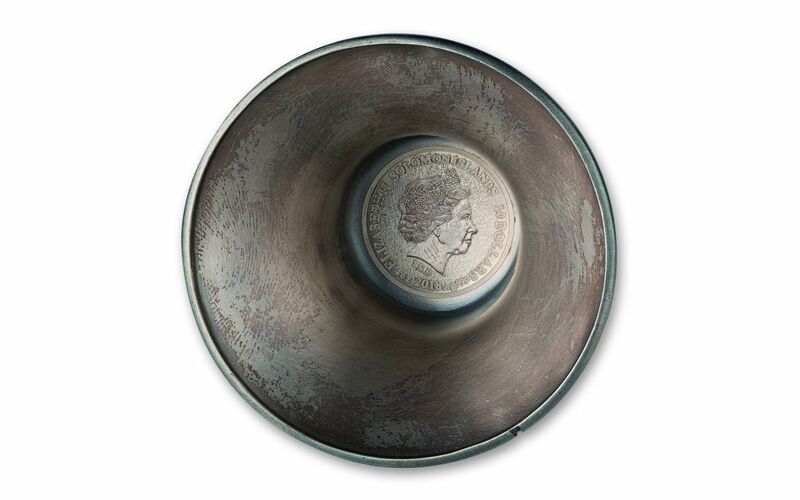 Inside the bell you can see the portrait of Queen Elizabeth II. STRUCK IN HIGHLY-PURE SILVER – Each 2018 Solomon Islands Liberty Bell Coin has been struck in four ounces of highly-pure 99.9% silver. LEGAL TENDER COIN – These 2018 Solomon Islands Liberty Bell Four-Ounce Silver Coins are $10 legal tender in the Solomon Islands, a nation made up of hundreds of islands in the South Pacific Ocean. The famous Battle of Guadalcanal was fought there during World War II. BREATHTAKING ANTIQUE FINISH – Your 2018 Solomon Islands $10 Liberty Bell Four-Ounce Silver Antiqued Coin has been struck with an eye-pleasing antique finish that gives extra depth to already-intriguing bell-shaped coin. The process of applying this finish means that no two coins are exactly the same. VERY LOW LIMITED EDITION – The worldwide edition limit for this unique coin has been set at just 1,776 in honor of the founding of the United States in 1776. 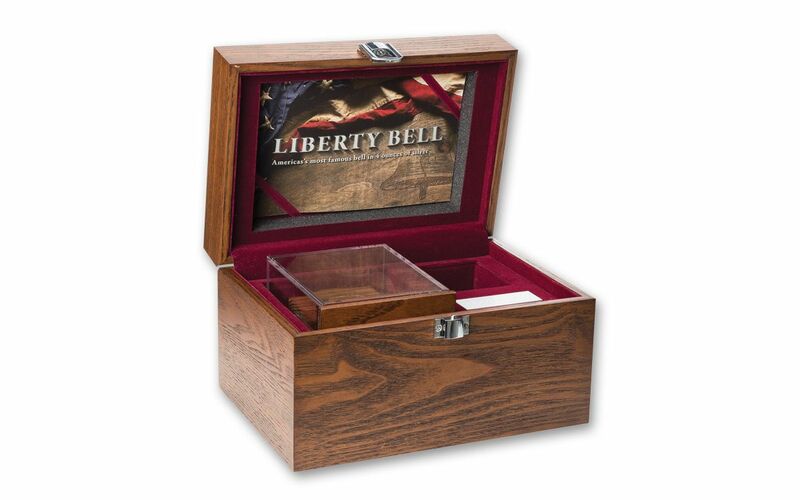 BEAUTIFUL PACKAGING AND PRESENTATION – The 2018 Solomon Islands $10 Liberty Bell Four-Ounce Silver Antiqued Coin comes in a its original government packaging consisting of a wooden case that holds the coin along with an acrylic case that will allow you to display this amazing coin anywhere in your home or office. This isn’t just a replica of Philadelphia’s famous Liberty Bell, it’s actually a legal-tender coin! It will make a great display in any home or office! Don’t miss out – order yours today!